Looking for the leading drainage specialists in the area? Premier Builders London offer a wide range of specialist environmental and drainage services to both commercial and domestic customers based throughout the Surrey/London area. With a combined 40 years experience in our industry, we serve the residents of London with quality craftsmanship and outstanding customer service designed to exceed the required health and safety standards, whilst delivering excellent value for money. 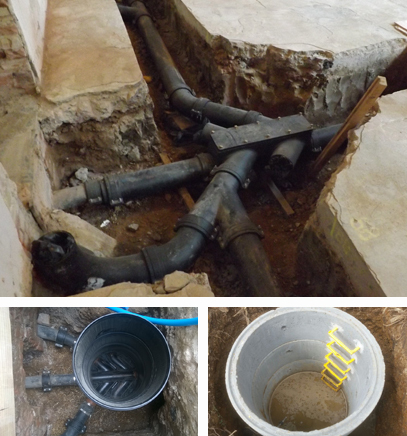 If your drainage system is blocked, broken or faulty, the Premier Builders experts will be able to promptly diagnose the issue before providing an accurate and effective method of implementing a lasting solution. Once agreed, we will move forward with the most appropriate and cost-effective course of action, such as drain cleaning and jetting, drain relining and drain excavation. No matter what the problem may be, you can find the expertise and assistance you’re looking for with our company. We aim to be a crack team of drain clearance specialists who can satisfy all your needs while also meeting the limits of your budget. Whatever your drainage problems might be, we believe that we can provide a lasting and cost effective solution. Please contact us today and get started on improving the health and flow of your drainage. For a free quote or to book an appointment for a drain inspection, please give us a call on Tel. No. 0208 641 7494 today! We can also arrange regular maintenance contracts for ongoing preventative work.